This article was submitted by Kelly W. Patterson, who originally published it on his personal blog. 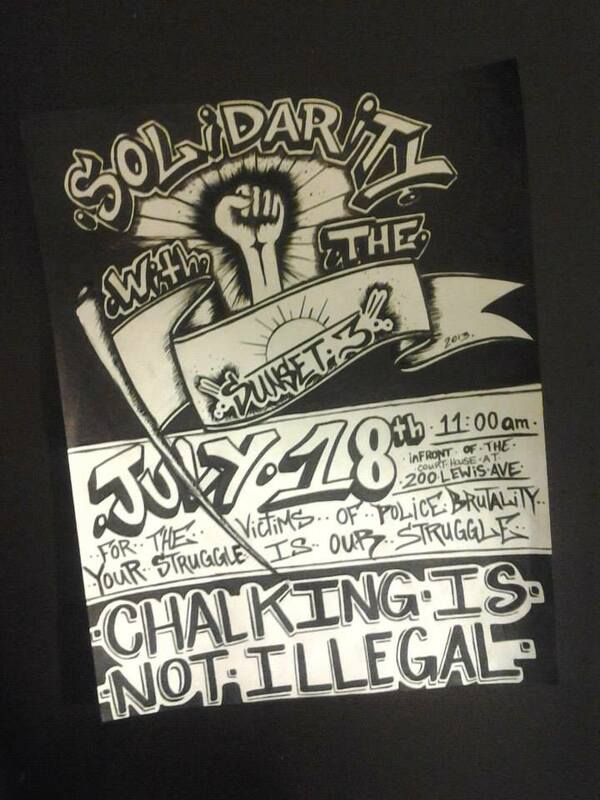 Chalk Washes Off, Injustice Never Will! Emma Goldman once stated that if voting actually changed anything they would make it illegal. The rapid progression of new laws designed (or existing laws twisted) to prevent different forms of direct action bears out the truth of that sentiment. Direct action truly does “get the goods” and whenever the establishment recognizes that something is an effective method of exposing them for what they really are the crackdown is inevitable. Among the terrorist cameramen, illegal milk traffickers, outlaw food sharers and cancer patients using unauthorized treatment methods another group has recently joined the ranks of the recipients of this treatment of making mundane, harmless actions illegal. This dangerous, scary group consists of people that draw on sidewalks with (gasp!) “sidewalk chalk,” something that (spoiler alert) is packaged for, marketed as, and primarily used to write on sidewalks. Of course, the fact that someone is writing on a sidewalk isn’t really the issue as evidenced by the masses of children playing hopscotch, public events featuring chalk drawing areas, and even businesses that use it for advertising on sidewalks nearby. It’s really the content of what people have written that have gotten them in trouble, which is pretty much the definition of a First Amendment violation (in spite of what Jeff Olson’s judge would have you believe). When a friendly game of four-square turns into an airing of the local police department’s record of police brutality and unwillingness to hold anyone accountable for that record of violence and murder, well then we have to protect the public’s property from an easily washed off, non-staining, material that will disappear on it’s own within a matter of a few days. It’s all fun and games until someone starts pointing out the crimes of the State’s enforcers and then the next thing you know people will be writing about how they steal people homes only to turn around and sell it to billion dollar corporations for less than market value or to people pretending to build stadiums nobody even wants and no local team can fill. 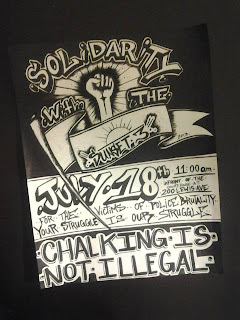 The reason that I know that chalking is an effective way of protest is because about a month ago, on June 8th, I along with two other members of the Sunset Activist Collective were cited during a Nevada Cop Block monthly protest for “graffiti” while listing the crimes and paying tribute to the many victims of the Las Vegas Metropolitan Police Department. 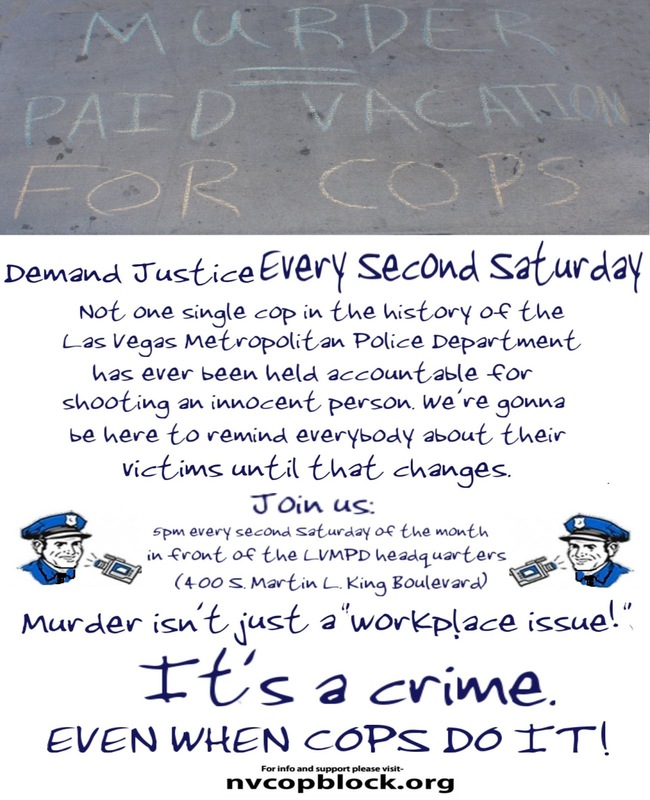 After nine months of “Second Saturdays” and other events calling for the accountability that is sorely missing within Las Vegas area police departments, we were told by a “graffiti expert” that drawing with chalk on a sidewalk is now illegal, in spite of us having been explicitly told by some of his own co-workers that sidewalk chalk is in fact legal previously. Inevitably, the upside to when the state cracks down on legal forms of protest is that they generally overreach and in the end often the public spotlight and embarrassment generated by their heavy-handed methods backfire in a big way. Such was the case when Jeff Olson wrote stuff about how corrupt the system was in favor of banks and then the San Diego police proved his point by bowing to the pressure of a bank manager to charge him in a case they didn’t even want to prosecute (and that even the mayor called stupid) with the outrageous potential of 13 years in prison for writing on a sidewalk with something that was manufactured for that explicit purpose. Our case, of course, doesn’t involve a penalty anywhere near that level of ridiculousness, although there are some bribery demands (i.e. fines) that could amount to as much as $1000, forced slave labor (AKA “community” service), and for some bizarre reason the removal of our legal ability to drive around for two years. Personally, I’m not particularly concerned about any of those things because the case is not just silly, it’s already been ruled in courts that chalking is legal and constitutionally protected as free speech. 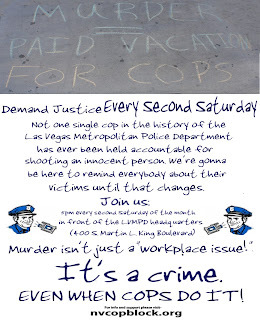 What has me looking forward to our court date on July 18th is the fact that this case and the subsequent lawsuit will bring more attention to the unchecked crimes of the LVMPD and their cohorts in and around Las Vegas than we ever did in those nine months of writing our demands on the sidewalk surrounding their (fancy new) headquarters buildings. And regardless if the outcome isn’t what I expect (and common sense dictates) it to be, I will continue chalking until Metro decides to stop allowing their employees to murder people without consequence. In fact, I won’t even be waiting until the current case is decided. The next “Second Saturday” is July 13th and we will be there chalking again. We will also be holding a solidarity rally on the morning of the 18th, prior to the trial starting, and there will be chalking that day. Unjust laws need to be challenged, especially when those unjust laws are themselves being used to hide the injustices of those in power and their enforcers. That’s why I won’t be putting down my chalk any time soon and you should pick up yours. The best way to overturn a bad law that violates basic human rights, such as the ability to protest injustices, is to violate those laws en masse in order that their true nature can’t be ignored. It’s even more true when the laws are silly and obviously being used in ways they were never intended to be. At 11:00 am (PST) on July 18th, join us at the Regional Injustice Center (see map below)to let them know that you want accountability instead of paid vacations for cops that murder people in your community and that they can’t silence you with petty, misapplied laws. If you aren’t in Las Vegas, then be with us in spirit, draw out some stuff on the sidewalk where ever you are, and join us in a lively round of hopscotch. We’ll see if they have the nerve and the room to haul all of us “graffiti artists” away.